Do you remember the first time you heard the story of Jesus’ death and resurrection? I can’t. For those of us who were raised in a church-going family, it’s one of those stories that’s . .. well, it’s just always been there. And that’s the way it should be. 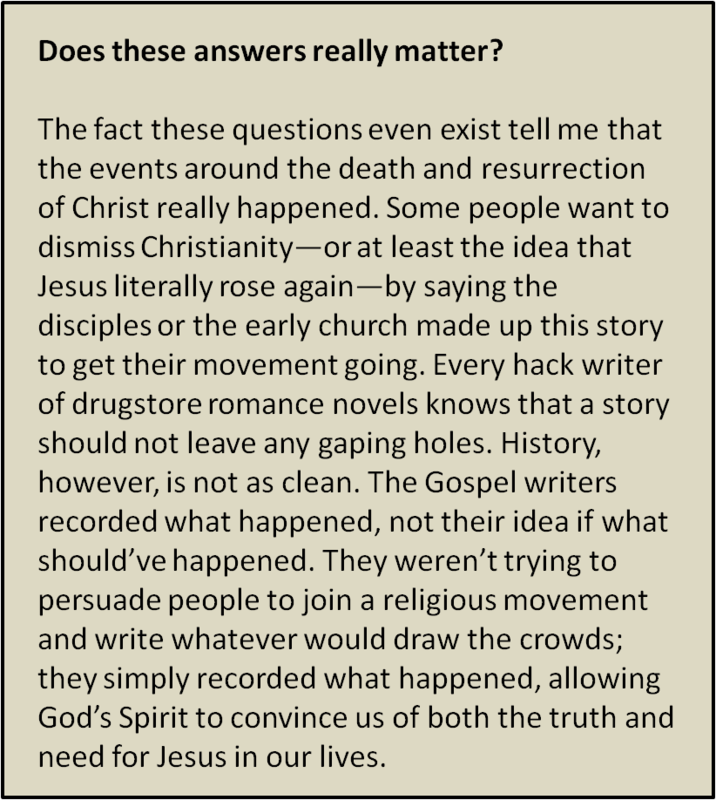 After all, what happened when Jesus died and rose again is the foundation for the Christian faith. It’s a story and a message that should always be before us. The danger we run into is that, because this pivotal moment in history may be so familiar to us, we can lose our sense of wonder over the death and resurrection of Jesus. Familiarity can cause us to skim over details without much thought. If you were telling this story to a child or teenager who had never heard it, those details would not be lost on them. And they would have questions. (Especially the teenager. He questions everything.) Let me invite you to revisit the story of Jesus and let’s consider some of the questions a child or teenager might ask. I won’t take the time to tell you the whole story, but let’s jump to just a few questions I can picture a child or teenager asking. What caused the people to turn against Jesus? On Sunday they laid branches at His feet, but on Friday they were screaming for His death. It seemed a perfect match. The people wanted a Messiah, and Jesus is the Messiah. The problem was that the people were expecting a different kind of Messiah. They wanted a powerful leader who would run the Romans out of town and restore Israel as a great nation. Jesus did come to set them free, but from sin, not government. The crowds were ecstatic that the Messiah came into Jerusalem, the capital of their faith, but it became clear during that week that Jesus had no intention of being the kind of ruler they were expecting. So they turned on Him. Jesus told one of the thieves hanging next to Him, “Today you will be with Me in paradise.” What does that mean? The thief had expressed an understanding and belief in Jesus as the Ruler of another kind of kingdom, one not of this earth. The thief knew Jesus would die, yet he also knew He would rule. Jesus promised this new believer a place in that kingdom. The Bible associates paradise with a park or a garden, and any reference to paradise was typically a reference to the blessings that came after the final judgment. So if paradise is associated with the final judgment, how could the thief be there immediately after death? Some people think this may refer to some sort of in-between state before heaven, but the Bible is clear that after Jesus ascended, He went to rule with God the Father. Maybe the answer has to do with the difference between our linear view of time and God’s view from eternity. We see one event happening after another; we say “time passes.” From the view of eternity, a time line is quite different. After all, to God “one day is like 1,000 years, and 1,000 years like one day” (2 Pet. 3:8). It’s a little hard to wrap our minds around, but from God’s eternal vantage point, perhaps the next thing anyone experiences after death is the final resurrection and eternal life with Christ. Where exactly was Jesus between His death and resurrection? 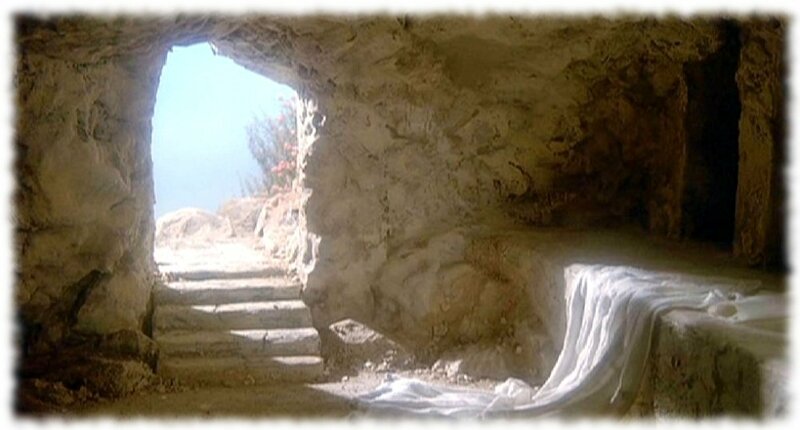 Let’s state the obvious: Jesus’ body was in the tomb! Usually, though, when people ask that question, they are referring to the idea that Jesus descended into hell after His death. This idea is based on 1 Peter 3:19: “In that state He also went and made a proclamation to the spirits in prison.” But is this verse saying Jesus went to hell? There are more interpretations of this passage than there are recipes for stuffing. For example, some believe Jesus preached to those who died during the flood in Noah’s day, and others believe that Jesus liberated all the Old Testament believers. The most widely held view, though, is that this is a reference to Jesus’ proclamation of victory over the evil spirits. It is important to read this one verse in light of what is said around it. Clearly, these are evil angels; in verse 19, Jesus declares His victory, and in verse 22, He is presented as Lord over them. When you read this in its full context (vv. 18-22), nothing indicates that Jesus made this proclamation between His death and resurrection. Why was Jesus “untouchable” to Mary after the resurrection? When Mary first recognized Jesus at the tomb, He told her, “Don’t cling to me.” This seems an odd request since Jesus later invited Thomas to touch Him (John 20:27). Mary was so elated to see Jesus alive that she was moved to take hold of Him and worship Him (and that is what happened according to Matt. 28:9). Jesus was not forbidding worship, but there are two things implied in His words. First, Jesus was going to ascend to the Father and the way Mary—and all of us—related to Jesus would change. No longer would there be a physical presence to hold on to; worship would now be in spirit and in truth. Second, while Mary wanted to take time to worship, Jesus had a more immediate task: She was to go to the disciples and tell them that Jesus was alive. Why didn’t the two disciples recognize Jesus as they walked to Emmaus? It’s hard for us to imagine two people who knew Jesus spending so much time in conversation with Him on the road to Emmaus and not recognizing Him. But before we write them off as complete morons, remember that others did not initially recognize the resurrected Jesus (John 20:14-15; 21:4). From a human viewpoint, they weren’t expecting a resurrected Jesus. Their words to Jesus, at best, show amazement at the idea that Jesus might be alive, but they sound like they had doubts. From a divine viewpoint, it seems that God kept their eyes closed long enough for them to hear why the death and resurrection were necessary. Luke 24:16 says “they were prevented from recognizing Him.” Your English teacher would remind you that the statement is in the passive voice, meaning the failure to see was something done to them by someone else (i.e., God). This article originally appeared in HomeLife magazine, April 2010. Comments based on the Holman New Testament Commentary for Luke 23:43. Comments based on the New American Commentary for 1 Peter 3:19. Comments based on the New American Commentary for John 20:17.